Have you ever wondered what the treasures you saved from your childhood might be worth? The Novium Museum in Chichester is encouraging people to dig out childhood favourites such as old toys, games tables and boxes, dolls, chess sets, Dinky toys, rocking horses, steam models and train sets for a special valuation day at the museum with Henry Adams Auctions. The valuation day will take place on Thursday, 10 May from 11am to 3pm. Valuations will be provided by Henry Adams Auctions on a free, no obligation basis, and are limited to five valuations per person. If you are tempted to go on to sell your items at auction, Henry Adams will generously donate their commission from the sale to support The Novium Museum. 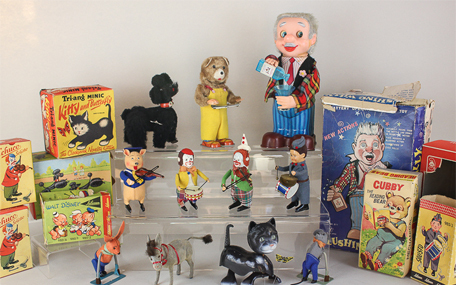 Andrew Swain, Fine Art Auctioneer and Valuer at Henry Adams Auctions, says: "Toys and games are not just for children. At auction, the market for items in this category is booming! Collectors range from those who appreciate everyday items, to avid buyers willing to spend large amounts to secure more unusual examples. For example we recently sold a rare boxed 'Scotty Dog' Pelham Puppet. Attracting interest as far away as America, it was hammered down at £290. "Childhood memories not only encompass toys, but other items that may have been kept through the years and passed down through the family, which have gained in value. Silver and Chinese items continue to fetch good prices, but more unusual items such as a 19th century wheelbarrow, wax mannequin heads, a ballot box and model table top engines have all recently fetched good prices at the Henry Adams saleroom." The valuation day has been organised as part of a series to run alongside Game Plan: Board Games Rediscovered, a major touring exhibition from the V&A Museum of Childhood, which is open at The Novium Museum until 1 July 2018. Game Plan, which is free to visit, celebrates the joy, excitement and occasional frustration of playing board games. Alongside family favourites such as Cluedo, Trivial Pursuit, and traditional games such as Chess, Game Plan looks at historical board games such as The Game of the Goose, as well as beautifully designed games from the 18th and 19th centuries. Councillor Eileen Lintill, Cabinet Member for Community Services at Chichester District Council, says: "Game Plan prompts visitors to reminisce moments from their childhood such as favourite games and toys. We hope that the valuation day will encourage people to dig out hidden treasures and help to evoke memories. "We would like to thank Henry Adams Auctions for generously donating any commission raised from auctions to support The Novium Museum." For more information about Game Plan: Board Games Rediscovered, and related upcoming events, visit The Novium Museum or call 01243 775888.